n ability to recognise class. So we’re taking a little trip away from the Stadium of Light to revisit some of Ken Gambles’ early heroes. One of the many unfortunate aspects of being in one’s 60s is that every month seems to bring news of the death of a footballer who was a big part of growing up. 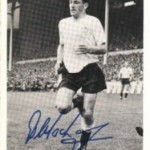 The most recent is the passing away of Dave Mackay, a terrific player for the Spurs side which, before it became relatively commonplace, achieved the elusive double by beating Leicester City 2-0 at Wembley in 1961 (watched on telly in good old black and white). He, of course, went on to play and manage with distinction at Derby County. I suppose from the early years of life to becoming a young adult we are at our most impressionable and emotional, and recently I’ve begun to realise just how much I admired some of the players for teams other than Sunderland. I certainly would never place them above my real heroes like Monty, Charlie Hurley and Neil Martin nor in later years Marco, Superkev or Sir Niall, yet looking back some players were a genuine pleasure to watch. 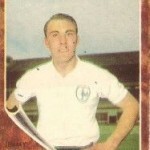 Probably the best goalscorer I ever have seen is Jimmy Greaves. Being at university in the late 60s and living in north London, I was able to watch Spurs fairly regularly. At that time they had some fine players, although the crowd could be a bit fickle. Greaves was an absolute delight, skipping around defenders’ tackles, hurdling the keeper and finishing off moves with precision. I can almost forgive him the four he scored against us in a 5-1 defeat all (if memory serves) from inside the box. I wasn’t pleased at the time though, I can assure you. I am sure he never dived or simulated injury or tried to con a penalty “a la Premiership” but stayed on his feet, as scoring was foremost in his mind. There is a story that when he was playing for Chelsea youths and scored seven, his coach at the time, Ted Drake, who had himself hit seven for Arsenal first team in the 1930s, told him to remember the day as he would never score seven again. The next week Greaves scored eight! Possibly my most vivid recollection is getting in late to White Hart Lane. Just as I caught m first view of the proceedings, Greaves collected a ball, skipped past about five Leicester defenders in and around the box then slotted it neatly past Peter Shilton in goal. Wonderful. What a really marvellous player he was. At this period the quality of England goalkeepers was very high which prevented Jim Montgomery from gaining the cap I always felt he deserved, being behind Banks and Shilton in the pecking order. 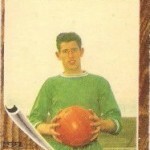 Another keeper I greatly admired though was Peter Bonetti, “the cat” of Chelsea. Sadly his performance in Mexico in the World Cup quarter-final 3-2 defeat to West Germany coloured most people’s opinion of him, yet week after week he turned in superb performances in goal for Chelsea, being almost balletic in the way he leapt for crosses, catching them cleanly. This was in the days of cotton gloves, no Sepp Maier-type “shovels” and less protection from referees. Not a huge keeper, he would acrobatically fling himself bravely at the feet of forwards in a mudbath of a penalty area. 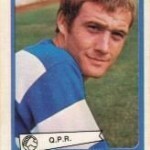 He was a superb shot-stopper and it’s a shame he became tarnished by one bad game. What stays with me is not that game, but his consistently heroic performances season after season for “The Pensioners” (remember that nickname?). This leads neatly onto another player whose reputation also suffered after the 1970 World Cup. Jeff Astle was your typical old-fashioned centre-forward, peerless in the air, always a real handful for defenders and a lethal finisher. He led the West Brom line with distinction and I always relished his hard but fair approach to the game, except when he was playing against us, of course. He was rightly capped by England but unfortunately is remembered by many for his miss against Brazil. As with Peter Bonetti it seems unjust that years of excellence can be forgotten when set against one bad game, or even one bad miss. He gave memorable service to the Baggies and was always a pleasure to watch. 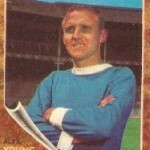 Another forward who stood out in this era and was one to admire was Alex Young of Everton. He played in the fine Everton side that won the League in 1963 and played at Wembley where a 3-2 win saw off Sheffield Wednesday in the FA Cup Final of 1966. Young was readily noticeable for his blond hair but more so for his silky skills and reading of the play. He was a totally different leader of the line than Jeff Astle, but just as impressive, at times making the game look easy with his sublime skills. It was a privilege to watch him play. Danny Blanchflower coined the sobriquet for Young, “The Golden Vision”, which summed up concisely his impact on football and on Toffees fans in particular. In fact there was a TV drama from the late 60s called The Golden Vision, an entertaining hour or hour and a half about fictional Everton fans on a day out for a match in Newcastle. I think it was written by Jack Rosenthal. My final choice in some ways surprises myself for I’ve never been a fan of the brilliant yet cocky and arrogant sportsman such as Gazza or Kevin Pietersen or Jimmy Connors, but I’ll make an exception for Rodney Marsh. For sheer unadulterated enjoyment (the exact opposite of current fare at the SoL), a trip to Loftus Road in the late 60s was unforgettable. 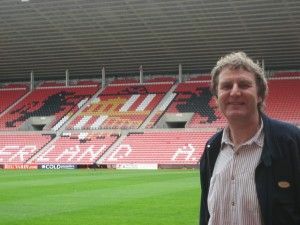 It was football with a smile on its face and being Division 2 (the present Championship) meant that results had no bearing on Sunderland’s progress. Marsh was entertainer supreme, hamming it up for the crowd with his skilful tricks, yet his ball control, vision and finishing were first class. I imagine it must have been similar to watching Shackleton at Roker, although this was before my time. With today’s wall-to-wall coverage it’s easy perhaps to get sated with football, seeing too much of players, with cameras covering every angle and every goal, whereas years ago it was more special to watch footballers in the flesh or in brief highlights on television. There certainly seemed more engagement then and more allure. Or more likely I’m just growing too old. * The photographs are taken from Nigel Mercer’s fascinating Australian website, Nigel’s WebSpace. Nigel has kindly given me permission to use examples from his site, which you should check out. It is a goldmine for anyone interested in football history. Coventry hanging on to Doncaster and Charlton as Portsmouth chase Barnsley, Sunderland and Luton. In the most recent ‘A Love Supreme’ there is an interview with Monty ( my favourite ever player) in which he has much the same view of Peter Bonetti, and of course his opinions carry far more weight than my own. Others . Colin Bell, Roy MacFarland, Alan Ball, and Tony Currie.